If you or your loved one suffered serious injuries because of a dog bite in Alabama, it is in your best interest to understand your rights. You may be dealing with several medical bills as well as a loss of wages because of an inability to return to work. The owner of the dog that bit you could be legally responsible for these types of expenses. In certain cases, you may also be entitled to damages for other considerations, such as your pain and suffering. The Birmingham dog bite attorneys at Farris, Riley & Pitt, LLP understand the complexity of dog attack claims. Our firm can make sure that liable parties are held accountable and you obtain all of the compensation you need and deserve. We know that you probably have many concerns about your case. Contact us at (205) 324-1212 to have Farris, Riley & Pitt, LLP review your case and answer all of your legal questions during a free consultation. Why Do I Need a Dog Bite Lawyer? Dog bites are unique cases because victims frequently know the liable parties quite well. The dog owner in your case could very well be a longtime neighbor, friend, or family member. As a result, you might have some fear about the personal financial hardship you will cause by filing an injury claim. Keep in mind that most dog attack claims are covered by a dog owner’s homeowners insurance policy. You might think that filing a dog bite claim will not be as challenging as other types of injury actions, but insurers are loathe to pay any amount of money for any claim. As a result, the settlements that they usually offer to pay individuals who do not have an attorney is typically much less that what victims are entitled. Often, time is of the essence in these types of cases, as Alabama only allows a person two years to file an injury claim. For this reason, you will want to contact Farris, Riley & Pitt, LLP as soon as possible. As soon as you hire our firm, we will quickly commence an independent investigation of your incident and secure the evidence important to your case. Farris, Riley & Pitt, LLP will also negotiate with the dog owner’s insurance company to try and arrive at a fair and full settlement, but we will not be afraid to file a lawsuit if the insurer will not provide adequate compensation. Our record of success includes several multimillion-dollar verdicts and settlements. 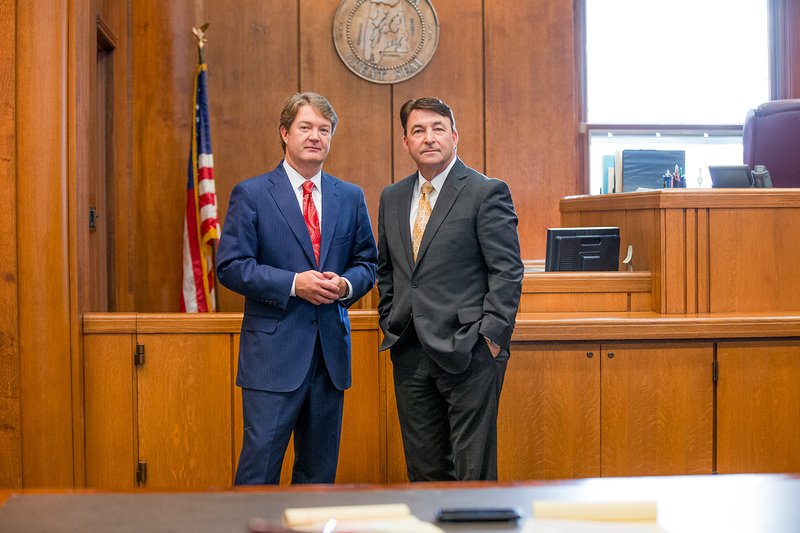 Kirby Farris and Ken Riley are both lifelong Alabama residents who have accomplished legal careers. Mr. Farris and Mr. Riley are both members of the Birmingham Bar Association, Alabama Bar Association, and American Bar Association. They are also both admitted to the Alabama Supreme Court as well as the United States District Court for the Middle District of Alabama, United States District Court for the Northern District of Alabama, and United States District Court for the Southern District of Alabama. We also provide legal representation on a contingency fee basis, so you do not have to worry about paying us any fees unless you receive a monetary award. You can have our lawyers examine all of your options when you call (205) 324-1212 right now. DogsBite.org noted that 20 different dog breeds inflicted one death each. The breed of dog is not necessarily the important factor in these cases. Alabama Code § 3-6-1 provides that when a dog bites or injures a person without provocation in a place where they had a legal right to be, the dog owner is liable to the person bitten or injured. The liability only applies when the dog bite occurs on property owned or controlled by the dog’s owner or when the victim had been on the owner’s property and was pursued by the dog. Under Alabama Code § 3-6-3, a dog owner is allowed to plead and prove in mitigation of damages that they had no knowledge of circumstances indicating their dog could be vicious, dangerous, or mischievous. If successful, the dog owner is liable only for the actual expenses incurred by the victim (also known as economic damages) but cannot be held liable for noneconomic damages, such pain and suffering or punitive damages. Some states use a strict liability approach for dog bite cases in which dog owners are liable for victim injuries regardless of whether the dog has previously bitten someone or acted aggressively, but a so-called “one-bite rule” involves a requirement that a dog owner have knowledge of at least one such prior incident in order to be liable. Alabama uses a combination of these two systems, as dog owners are strictly liable for economic damages but knowledge of a dog having been vicious, dangerous, or mischievous is necessary for noneconomic and punitive damage claims. If you do anything that could be considered negligence on your part that proximately contributes to your injury, it is considered contributory negligence. In a dog bite case, the owner may claim you antagonized or otherwise caused the dog’s reaction. Such allegations are important because in Alabama, a defendant in a civil claim can argue contributory negligence as an affirmative defense. When proven, contributory negligence will make a victim unable to recover any damages. In order to avoid this outcome, you will want to make sure that you contact Farris, Riley & Pitt, LLP before speaking to any insurance company representatives. What should I do if I was bitten by a dog? Your first step following any dog bite should be to seek medical care. Even if your injury does not seem serious, it is important to have any wound treated properly to avoid possible infection. Additionally, it is to your benefit to have a medical record created immediately so as to counter any claims from insurers that your injury claims are exaggerated or manufactured. Take pictures of your wounds before they heal. Do not get into any arguments with dog owners about liability. Instead, just be certain to get the necessary contact information for the dog owner and contact Farris, Riley & Pitt, LLP. You should refuse to speak to any insurance company without legal representation. Researchers with the Division of Unintentional Injury Prevention, the National Center for Injury Prevention and Control, and the Centers for Disease Control and Prevention found that between 2001 and 2003, an estimated 4,521,300 people were bitten by dogs each year. This translates to 1.5 percent of the population in the United States. Another CDC study found that 756,701 persons who sustained dog bites required medical attention. A November 2010 statistical brief from the Healthcare Cost and Utilization Project reported that there were 316,200 emergency department visits and 9,500 hospital stays related to dog bites in 2008, or an average of 866 emergency department visits and 26 hospitalizations a day. The same HCUP brief also stated that the average cost of a dog bite-related hospital stay was $18,200, which was about 50 percent more than the cost of the average stay for other injuries. The Insurance Information Institute and State Farm found that homeowners insurance companies paid more than $686 million in liability claims related to dog bites and other dog-related injuries in 2017. According to the Insurance Information Institute, the average cost paid out for dog bite claims nationwide in 2017 was $37,051, which was a 90 percent increase from 2003. The agency reports this increase is attributed to higher medical costs as well as larger settlements, judgments, and jury awards. The United States Postal Service reported that 6,755 USPS employees were bitten by dogs in 2016. A 2018 report issued by DogsBite.org found that more than 35 dog breeds contributed to 433 deaths in a 13-year period between January 1, 2005 and December 31, 2017. The 2015 Plastic Surgery Statistics Report by the American Society of Plastic Surgeons found that 28,079 people underwent reconstructive procedures related to dog bite repair in 2015. In 1997, the Journal of the American Medical Association estimated that annual monetary losses for dog bite victims could be as high as $2 billion. Farris, Riley & Pitt, LLP has been working on behalf of all kinds of injury victims in Alabama for more than 20 years. Dog attacks are very unique kinds of cases, but the severity of the injuries can cause just as many problems for victims other injury claims. If you or your loved one was bitten by a dog in Jefferson County, do not hesitate to contact Farris, Riley & Pitt, LLP. You can have our lawyers provide a complete evaluation of your case when you call (205) 324-1212 to set up a free consultation. Click here to learn more about our injury cases and our law firm.